Many years ago, I purchased a cookbook called Garlic, Garlic, Garlic!. I purchased it pretty much for the sake of one recipe, garlic fudge. I figured that garlic fudge was not a recipe I was going to find anywhere else, possibly because there can’t be too many people who would not only come up with an idea that insane, but also be able to persuade their publisher into including it. I went straight home and made the fudge. It was… not good. 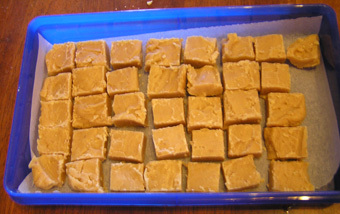 I’d never made fudge before, which probably didn’t help, and the sharp, uncooked garlic flavour (the original recipe infuses the butter, sugar and evaporated milk on a very low heat with six cloves of garlic, so the garlic does not cook) was bizarre and rather unpleasing. A normal person would probably chalk this up to (regrettable) experience, and leave garlic fudge (and garlic ice-cream, for that matter) well and truly alone. But for reasons even I don’t fully comprehend, I was looking at this recipe again the other day and thought, you know, if you roasted the garlic, it might actually work… Roasted garlic, after all, becomes buttery and sweet, just like fudge! How could this possibly go wrong? Your shopping list – if you dare! Now what will you do with it? Make a horizontal slice across the top off your bulb of garlic, so that all (or most) of the cloves have a little of their tops showing. Place the garlic on a piece of foil, and pour a little oil the exposed cloves. Roast at 200°C for 40 minutes or until soft. While the garlic is cooking, put a few saucers of water into the fridge to get cold, and line a 18 x 18cm square tin with foil or baking paper. Squeeze the soft cloves out of their papery skin into a large saucepan. Mash a bit, and add all the other ingredients. Put on the lowest heat you can, and heat gently until the butter is melted and you can’t feel the sugar crunching under your spoon. Pour through a seive to remove the garlic, and pour back into the saucepan. Bring to a gentle rolling boil (this is why you need a large saucepan, incidentally, because otherwise your fudge will rise up in rebellion and overflow its bounds and you will get burned and have a big mess to clean up), and cook, stirring often, until the mixture thickens and gets a little darker in colour. When you think it’s done, remove from the heat, and drop a drop of mixture into a saucer of cold water. If it holds together and the water doesn’t get cloudy, take the pan off the heat (otherwise, of course, keep cooking until it passes this point). Stand for about five minutes, then beat vigorously until it starts to crystallise on the side of the pan (another good reason to use a large saucepan – bigger surface area = faster cooling = arms don’t get nearly as sore). Spread fudge into the tin – it should be about 1 cm thick. Don’t use your finger to get fudge off the spatula like I did, or you will find yourself typing with nine fingers instead of ten, like I am. When firm but still warm, score into 1 inch squares. Leave to cool completely and store in baking paper in an airtight container. Feed to the unwary! I don’t know if you could make this dairy free, to be honest – I don’t make fudge often enough to know whether it could be made with nuttelex and coconut cream or something, but I am dubious, and even if you could, I really don’t think coconut cream and garlic would be a winning flavour combination. Or even a slightly dubious but not actively awful flavour combination. ← Market Day – still not Spring! I want to try that, and I don’t even like fudge. Well, I’ve got plenty of fudge and surprisingly few takers… we could meet up? I am reminded of the time Jon Singer brought a garlic chocolate quiche to Minicon. I didn’t know it at the time, but the chocolate was a very good quality dark chocolate. I didn’t have the courage to taste it at the time – now I wish I had. It DID disappear! Let us know what your scientists think of it! Are you going to warn them in advance, or this going to be one of those borderline psych experiments? I have a recipe for garlic chocolate ganache!! yup this sounds weird – I do like the idea of this for a taste test – it would just mess with your taste buds! I wonder whether elephant garlic would work? It’s milder and sweeter in flavour. Also, to the commenter who wondered about making it dairy-free; I make low dairy chocolate fudge by using water instead of milk. Works beautifully. I tend to burn fudge if I use milk or cream. It’s not totally dairy-free with water, since there’s butter in the recipe. But you could sub margarine or coconut oil for the butter. Garlic and coconut taste amazing together in savoury foods, so it could work with this as well. I bet elephant garlic would work! I have a feeling that while you would certainly get *something* of the right consistency if you replaced the milk with water and the butter with coconut oil, it might not be fudge any more… it’s pretty close to not being fudge already! Anyone Can Cook Vegetarian Food: A Lunchbox Challenge!